Tournament quality bristle dart boards are made of natural sisal rope fiber. (Sisal fiber is made from the leaves of the Agave plant, the same plant species from which tequila is made.) These rope fibers are compressed under tons of pressure and banded with steel, then bonded to a non-warping backboard. The surface is later sanded smooth and then screen-printed with the appropriate colors. Finally, the wires attached and the number ring attached with clips, to allow easy rotation of worn areas. The English company NODOR first developed bristle dartboards in the 1930's, and introduced commercially in 1936. Before that time, dartboards were generally made of elm wood, although the NODOR company also made a plasticene dartboard. Each person should have one set of 3 darts. Each person throws 3 darts, then removes them before the next person throws. There should NEVER be more than 3 darts in a dartboard at one time. It is difficult to share one set of darts, as it drastically slows down the game. Darts is not a game where blocking scoring areas by opponents is allowed. And having more than three darts in the board means more damaged darts & "robin hoods" due to hits from following darts. Also, people have different hand and finger sizes, so darts are not one-size-fits-all. That is another reason why it is often hard to pick just the right dart from a catalog or online site. You really need to try the darts before buying. When buying darts, visit a darts shop that has boards setup for trying out the various darts styles available. Brass Darts ~ Brass is a fairly dense (heavy) metal, is relatively inexpensive, and is easy to machine. Unfortunately, it is so soft that the machined "grip" may quickly wear down, changing the "feel" of the dart. Brass Darts are commonly mass-produced on automated lathes, so the quality and consistency of the machining may vary considerably. Brass darts are often used as "house darts" due to low price. Tungsten Darts ~ Tungsten is an extremely dense metal, heavier than lead for the same size item. Tungsten darts are therefore more dense than Brass or Nickel/Silver Darts. This means smaller diameter barrels, better "feel", and tighter possible groups on the dart-board. Tungsten is also very durable, and the machined grip will not wear down as rapidly as on Brass or Nickel/Silver Darts. For darters, having all of the dart's mass concentrated between the fingertips, enhances control of the dart. Tungsten is also very durable, so a high-density tungsten dart resists wear and the grip will last much longer. On softer metal darts, the grooves and rough knurling may wear down fairly quickly from skin acid, friction, and hitting other darts. Shafts serve to hold the flights away from the center of mass of the dart barrel. The shaft acts as a lever to make the flight more effective at resisting sideways motion. A longer shaft will produce about the same effect as a larger flight. There are a plethora of different shaft designs, but all serve essentially this same purpose. SHAFTS - Plastic ~ Inexpensive, and available in many colors, but break fairly easily. Good shafts until you start throwing tight groups and breaking lots of shafts. Materials are usually polycarbonate or nylon, some have replaceable tops for greater longevity. SHAFTS - Solid Aluminum ~ More rigid and durable than Plastic or Composite Shafts, in many colorful styles, some with decorative engraved stripes, flutes, or spirals. May tend to vibrate loose, especially on heavy darts. When used with thick flights, such as Dimplex or Nylon, the slots may need to be pried open slightly, with a dart tool or knife blade. Will normally bend instead of breaking when hit; just straighten for more use. . Note: Aluminum shafts often vibrate loose when playing, so rubber O-ring lock washers are highly recommended. This only occurs when there is a metal-to-metal contact, so plastic shafts do not normally need the lock washers. SHAFTS - Spinning ~ A variety of shaft styles are now available, that allow the flight to turn out of the way when struck by another dart. Spinning shafts do nothing to improve the flight of the dart through the air, but they do allow tighter groups by letting the flights align with each other. Also, these shaft will greatly reduce torn flights and "robin-hooded" shafts. The game of '01 is the classic game of Darts, played world-wide. The "01" refers to the fact that the game is played from a certain number of points, always ending in "01". For example, the common tournament game of 501 (pronounced "Five-Oh-One"), is played from 501 points. Other variations are 301, 601, 801, 1001. The higher point games are usually played by teams. The object of the game is simple... each player starts with the same score (501, for example) and the first to reduce his score to zero wins. Players take turns throwing three darts each and subtract all points scored from their own beginning score (501). Each player removes his darts and marks his score before the opponent throws. Darts that bounce off or miss the board do not score and cannot be rethrown that turn. The difficult part of the game lies in the finish, known as "going-out". To win, you must reach zero before your opponent, but you must also reach exactly zero, and the dart that brings the score down to zero must be a double. Doubles consist of the numbers in the outside narrow scoring band and the center (small) bullseye which counts as 50 points and is an actual double of the outer 25-point bull. For instance, if you have 2 points left, you must hit a double-1 to bring the score down to zero. From 18 points, a double-9 would work. If you have an odd number left (a number that cannot be divided by 2), then darts must be thrown to reduce the score to an even number, before throwing at a double. For instance, there is no possible double out from 19, so a way to finish would be to throw a single-3 first, reducing the score to 16. The 16 can then be "taken-out" by throwing a double-8. The games of 501, 601, 801, 1001, etc. are all played the same way, except for starting with more points. The game of 301 is different, however. Because of the potential for a very short game, 301 has an added difficulty...the game must start with a double. That is, each player must hit a double (any double) to start scoring. Each players scoring begins with the score of the first dart that hits a double. HARD FLIGHTS ~ are made of a stiff polyester plastic that holds shape well. The layers are permanently sealed together by heat during manufacture. Because the plastic is harder, they don't tear as easily as Soft Flights... however if they do tear, they cannot be resealed and are ruined. Hard Flights do not flex like a Soft Flight when hit, but do "pop off" the shaft when hitting another dart. This is desirable as it reduces deflection and allows tight groups. Hard Flights were originally made of a clear plastic, which resulted in fairly dull colors in printed designs. During the last few years, Melinex, a type of opaque plastic, has been used for printing hundreds of brighter designs. Also known as "Poly Flights"
NYLON FLIGHTS ~ made of ripstop nylon fabric, ar by far the most durable type of flight. These dart flights are are very hard to tear. The stiffness varies according to the weight and type of fabric used by the manufacturer, but is roughly midway between Soft and Hard flights. The most common point of wear with this flight is at the front, where it is inserted into the shaft. Since ripstop nylon fabric is a thicker material, it is important to pry open the slots on the shaft for a properly loose fit to avoid damage to the flight. Nylon Flights are available in solid colors and dozens of printed designs. DIMPLEX ~ and other similar styles are actually hard flights which have been embossed with a texture. The bumpy or ribbed surface tends to stiffen the flight, which some darters consider desirable. The extra surface area also adds a small amount of drag to the flight, which makes the dart slightly more stable in some cases. The various embossed types of flights are generally a little harder to insert into a metal shaft, due to increased thickness. Use a dart tool or knife blade to gently spread open the slots at the back of the shaft. All types of flights tend to split at the back center, where the folds meet and are hit by dart points. FLIGHT PROTECTORS are small metal or plastic devices that fit over and protect this area. The life of a set of flights may be greatly extended by using Flight Protectors. They are also reusable and may outlast many sets of flights. A steady Stance is very important. Don't lean way over the line to get closer to the board. This one is a tough habit for some people to beat, but try.. as leaning robs the darter of stability. The feet and legs should be positioned in a solid, comfortable, and relaxed stance, with weight distributed to both feet. Excessive leaning places nearly all of the body weight on one foot, tiring the shooter in long matches and damaging accuracy in the short run. The few inches gained by leaning over the line are simply not worth the huge loss of balance and stability. Plus, leaning lowers the shoulder, forcing one to throw upwards, fighting gravity. Leaning also usually means tensing the major muscles of the body to preserve balance. This often results in a jerky release and poor follow-through, since the body is already off-balance. A number of long-time players report back, knee, ankle, and foot pain, from spending many years standing on one foot while playing darts. Even in the short run, leaning to throw will cause minor pain in the small of the back. Especially for older players, a firm stance will stop this discomfort, both while playing and the next morning! In what other sport would you drink a few beers, try to stand balanced "tiptoe" on one foot, and then try to consistently hit a small target with a sharp pointed object? In EVERY competitive sport, Accuracy begins with a Solid Stance! Keep your feet planted solidly on the floor, and avoid lunging, rocking, or lifting the back foot off the floor during the dart toss. This is often done in an attempt to get a harder throw. The dartboard really does not care how hard you throw the dart! The only important thing is how accurately you throw it.! Even a light throw, if accompanied by a smooth and exteded follow-through, will easily reach the dart board and score. Such wasted motion can really be a bad habit, as it affects the entire body and throw. Lifting the foot even partway from the floor deprives the body of good balance during the crucial moment of follow-through. The strength required to reach the board with any normal dart is minimal, and for best accuracy should be providedonly by the fingers, wrist, and forearm. After the dart leaves your hand, let your hand and arm continue on towards the dartboard, ending with full extension, and the fingers pointing at the target. Imagine that you are bowling.. after letting go of the ball, you still must follow-through! The same applies to Golf, Billiards, Basketball, and most every other sport. Follow-through after realeasing the dart, ending up with your fingers fully extended, as though touching the spot that you want to hit. Missing the board or hitting too low often cause beginners to think that more power is needed. This is rarely true, as one can tell by the fact that the missed darts usually hit hard enough to stick in the wall, which is quite a bit harder than a bristle dartboard. The problem lies with the accuracy of the throw and follow through. Even small children can be taught to throw accurately without lunging or using the shoulders in a throw. If you feel short of power, stand upright, and keep your elbow up. The upper arm should be approximately parallel to the ground. This allows you to bring your arm back further, without hitting yourself in the face with the dart! Stand Straight, Elbow Up, and you will effectively double the power of your throw without any extra effort. For one thing, the dart is much higher than when leaning, so gravity does much of the work for you. The dart should be held in a level position, and maintain as level a stroke as possible. Don't hold the dart sideways, or in any other position than level and pointed at the board. Skill at darts, or any other target sport, means being able to perform the same motion exactly the same way, time after time. Common sense, as well of years of studies in other sports, show that all non-essential motion should be avoided and discarded from the darter's routine. In Darts, this means that if the dart is to strike the board at a level attitude (nearly always the best), it should be held and thrown from a position as close to level as is possible. Any other position (such as dart point-up, dart point-down, or sideways) means extra motion of all the hand and wrist muscles to correct the initial starting position. Pure wasted effort... and usually futile, since the dart will likely leave the hand at an angle and wobble all the way to the board. The correcting motion needed to get the dart pointed back at the dartbaord imparts inertia to the dart's mass, away from the direction of the target. Then the darts will often stick in the board at odd directions. After a long period of play, when concentration starts to slip a little, this can really be obvious, with darts hitting at all sorts of different angles. Instead of "throwing" the darts, instead just gently "place" them in the dartboard with a smooth motion of your hand & fingers. Throwing like a baseball is unnecessary and even dangerous, as a dart thrown too hard may hit a wire or other object and bounce clear across the room to hit someone. Dartboard wires get bent and the bristles crushed from this type of abuse. A dart should never be thrown so hard that the front of the dart barrel touches the bristles. If this happens when a dart is thrown normally, then the dart's point is too short and should be changed at a darts shop. Avoid Spinning the dart as you release it to add stability. Spinning the dart is often done inadvertently, and is a symptom of uneven release, usually a side effect of wrapping fingers OVER the dart, which then forces the dart to roll off the fingers on release. Instead, grip a dart gently from the sides, so that it easily flies free upon opening the fingers. All parts of the hand should leave the dart at nearly the same time to ensure level flight. To achieve this, make opening the hand a positive motion, and open the fingers and thumb rapidly to an extended position, ending up pointing at the target. This will also help keep the flights from touching the fingers as the dart leaves the hand. As an exercise to get that quick release, imagine dipping your hand in a bucket of paint, then fling it at a spot on the wall. If your hand ends up towards the floor or ceiling, that is where the paint would have gone! Let your fingers end up naturally open and pointing at the exact spot where you want the dart to go. Purposely adding spin to a dart-throw is wasted effort at best, and spinning the darts can actually make your game worse by causing uneven release. Most darts flights are not shaped to properly induce spin, and the darts fly too short a distance (less than 6 feet) for aerodynamic spin to be a stabilizing factor anyway. Errors in math, as written on the chalkboard, will stand as the valid score for the game unless corrected prior to the next throw made by the team for which the error was made. Chalkers may inform the shooter what he/she has scored and what score remains, if requested by shooters. NO DART MAY BE TOUCHED BY THE THROWER, ANOTHER PLAYER, CHALKER, OR SPECTATOR, PRIOR TO THE DECISION AND ANNOUNCEMENT BY THE CHALKER. 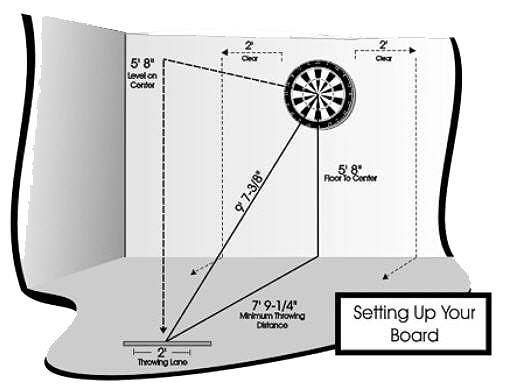 IT IS THE RESPONSIBILITY OF THE PLAYER TO VERIFY HIS SCORE WITH THE CHALKER BEFORE REMOVING HIS DARTS FROM THE BOARD. NO YELLING FROM BEHIND THE SHOOTER from either team. At no given time should anyone but the shooter and the chalker be figuring out the score if there is a problem then they need to get the captains or acting captains from both teams to check the score. DO NOT PULL YOUR DARTS FROM THE BOARD UNTIL YOU AND THE CHALKER HAVE AGREED ON THE SCORE. If you pull your darts and you do not agree with the chalker or vise versa then your score will count as zero.